The one-frame design of the platform established on four sensors provides the small height of the cargo reception surface over floor level. For convenience of work with platform and hydraulic carts scales can be completed with ramps. For installation in priyamok scales are completed with the basis frame. The platform of scales is established on four tensometric sensors, providing reliability and durability of the design. Availability of adjusting support allows to establish the cargo intake optimum. The cargo intake is painted by powder enamel that ensures reliable functioning at adverse conditions. Scales are recommended for use at the distributed loadings. 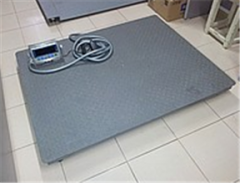 Unbelievable price on Scales platform from 1000 to 3000 kg in Almaty (Kazakhstan) company A Tehcentr Plyus, IP.